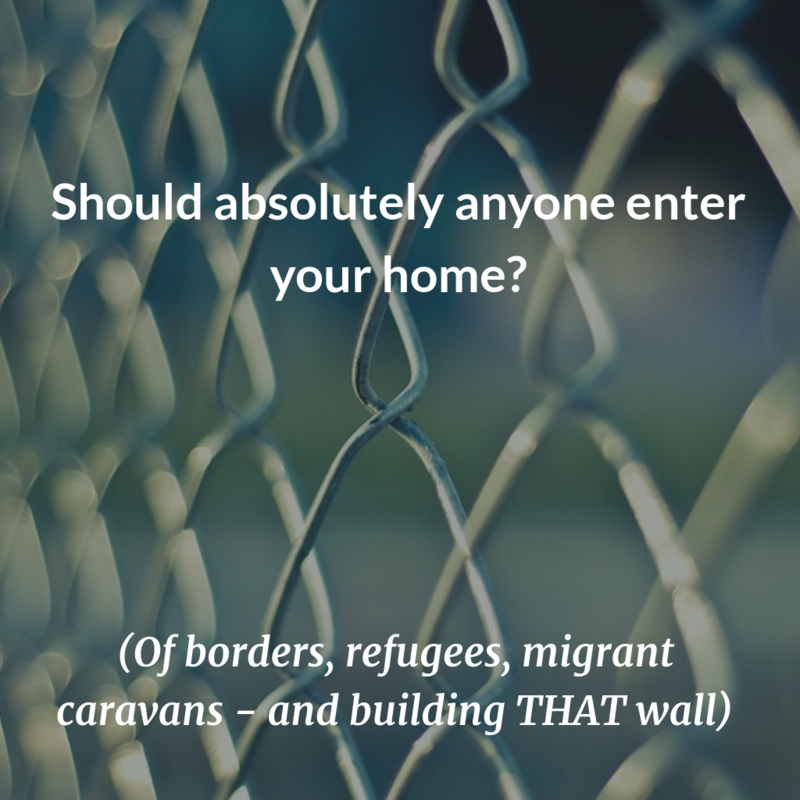 Should absolutely anyone enter your home? At the moment, world politics is focused on migrant “caravans”, refugees, and migrants entering Europe. As an Australian migrant now living in New Zealand, I’ve been following the topic with interest. A lot of people feel strongly that we should all have open borders around the world. Open Europe, open the United States, open Australia and New Zealand. Allow everyone in, and help anyone who needs it. And a lot of people don’t feel that way but are silent, for fear of being labelled “racist”. I’m going to say the unsayable, and tackle this hot topic. Please feel free to comment – especially if you disagree! Thoughtful discussion is what we all need right now. Does a nation have a right to borders and boundaries, and to refuse entry? People knock at the front door of our home then we choose whether to let them in or not. We get to say no if we feel like it. We don’t have to give a reason. If someone breaks in, we can use force to repel them – or call the police to boot them out. Nobody has the right to just walk in, break down our door, and demand our stuff. Our doors also have locks, to keep bad people (thieves and such) out, and to keep our family safe. I believe that a nation, just like a family home, is entitled to decide who enters in and who doesn’t. If a nation doesn’t have borders, is it even a nation any more? If America has no borders, where does America end and begin? I’d argue that without borders, America no longer exists. It’s just a plot of land that anyone can claim. Heck, if the US has no borders, what’s to stop China marching in and claiming US territory? Nothing! If we don’t defend our property, others who are less trusting will happily take it. That is a rule of nature, from wild animals through to the schoolyard and the courthouse. If we believe in America – or any other country – then we necessarily believe in borders, and must defend them from those who would encroach upon them. If a would-be citizen doesn’t recognize our immigration laws, are they likely to recognize and value other laws? I’d argue if a would-be citizen’s first act is to break through our borders and enter illegally, they don’t honor our laws much at all, and are unlikely to be a positive addition to society. Is migration the best way to help people? Europe has welcomed over one million migrants over the last three years, most of them from Africa and many of those from Nigeria. Europe has a current population of just under 750 million people. It could take in all of Nigeria’s current 200 million (expected to double in the next generation to over 400 million), yet still not make much of a dent in Africa’s total population of 1.3 billion. Migrants can only ever be a small percentage of a population, and the best way to help a population is clearly not migration. Foreign aid is a much better solution, and teaching developing nations to help themselves better again. Has unchecked migration always happened? Some people – including the UN – claim that unchecked migration has always been a huge part of humanity’s history. This is not true. The difficulties of distance and travel have meant that the vast majority of the world’s population have remained in one place for most of their lives, and the huge amount of movement that is currently going on is a very recent phenomena. Take my family, for instance. My mother is British, and her family had been in the same English village for at least 400 years. My father’s family had also been in Britain in another village for at least that long. My parents emigrated (legally) to Australia, and I legally emigrated to New Zealand. Other families have similar stories. My partner’s family moved to New Zealand some decades ago, then stayed put. My best friend’s family move to Australia several decades ago – and stayed put. The US has mountains of families who all emigrated hundreds of years ago, then found somewhere they liked – and stayed put. Is free migration a right? No, no more than anyone off the street has the right to enter your home. Our governments get to choose who enters and who does not – and they can deport overstayers and illegal immigrants. 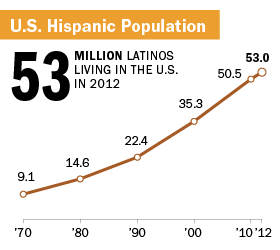 The increase in the US hispanic population since the 1970s has been remarkable. As of 2013 there were an estimated 53 million latinos living in the US (from a total population of 325 million). There are also estimated to be another 22 million illegal latino immigrants currently resident in the US at present. While a wall, or fence, will address some of the issue, it is clear to me at least that there is an ongoing issue with illegals that needs to be solved. Bringing more people into the US – from anywhere – will simply lower low-skill incomes for workers across the board, lowering the standard of living for legal US residents. This is not a race issue – although it looks like one. This is about protecting the wages, livelihoods and standard of living of low-waged US workers. US citizens have to decide, with their votes, whether they care more about foreign illegals or native Americans. Be under no illusion, if Trump manages to deport so-called “anchor babies”, US wages – and the resulting standard of living for native US citizens at all levels – will significantly increase, due to the labour shortage in low-skilled jobs. The gap between the very rich and the poor will also decrease, as business corporations are forced to pay higher wages. It doesn’t end there. The population of south America as a whole is 430 million people, many of whom – as we are currently seeing with the migrant caravan issue – would love to come to the United States. Should they be let in too? Or should they be given support to fix the problems in their own countries at home? Whichever way you look at it, unchecked migration and open borders start to look more like part of the problem than part of the solution, once you start to look at things fully. It’s our responsibility to help the world’s poor! Well, yes, it is. But which poor?. If you take a look at your own country, you will find plenty of poor people to help, close to home. No matter where you live. Even the wealthiest countries have poor that need help and support. Even Manhattan has homeless people, and the need for more shelters. I believe it is our responsibility to help our neighbors first. Help our own poor. I don’t believe we will ever solve the poverty problem but then and only then will it be time to import more poor from around the world to help. Or maybe they’re just trying to save their lives. Or the lives of their loved ones. I bet you would do the same if you had the misfortune of being in their position. How lucky for you that you have never been. I absolutely agree with you. I *am* lucky that I’ve never been in that position. I also can empathize with the people who are trying to get into the US (and Europe, and the UK, and Australia and New Zealand, and all the other first world countries). Most of them are just trying to do so because they want a better life for themselves and their kids, and who can blame anyone for that? But all of those countries have ways and means for people to enter legally. They all accept a LOT of refugees and immigrants. I think NZ accepts about 130,000 immigrants a year – a LOT for a country of our size (just under 5 million people). The best stats I could find for Australia indicated that it accepted just over half a million in 2013, and it has a total population of just under 25 million. I don’t have figures for the US but I know that Europe has accepted one million officially since 2015 and unofficially between 9 and 12 million. In short, there are legal pathways and plenty of them. What I also know is that the WRONG way to seek entry is to throw rocks at border guards and break down fences and DEMAND entry. You’re not going to win friends and influence people doing that. Yes, I get that people are desperate but they do say that it in desperate times that we see the measure of a man. I agree, as much as it would be great to help all the poor people in the world, we can not let strangers into our home or country who will not abide by our laws. I agree. I think it would be wonderful to be able to help everyone. But if it comes to a choice between helping poor children in New Zealand, and helping people overseas, my loyalty lies with my own country’s needy. We need to help our own first. I live in America and do a lot of volunteering and I have worked with so many illegal Irish, Polish and Russians but you only care about immigration now because people who don’t look like you are doing the same thing? Funny thing is most of you are not native to the lands in which you live. But your privilege and violence of your ancestors allowed you to be where you are. Live as simple live as you want but in due time you will reap what you sow even if only within your cold heart and your children will see you for what you are. I don’t trust anyone who sees the worlds condition and has no empathy and also puts quotation marks around racist. Good article and I “almost” agree with the sentiment although not with every point you made. The economic view that US wages will rise if illegals and anchor babies are deported because of a labor shortage is incomplete. When labor shortages happen, production decreases as well (labor = most important economic resource) thereby increasing the prices of things produce. Also, since wages will increase due to labor shortage, that increase in-turn will raise prices as well aka general inflation. This price inflation will in-effect negate any wage increases.